I have also included my own background to my painting of Slava. 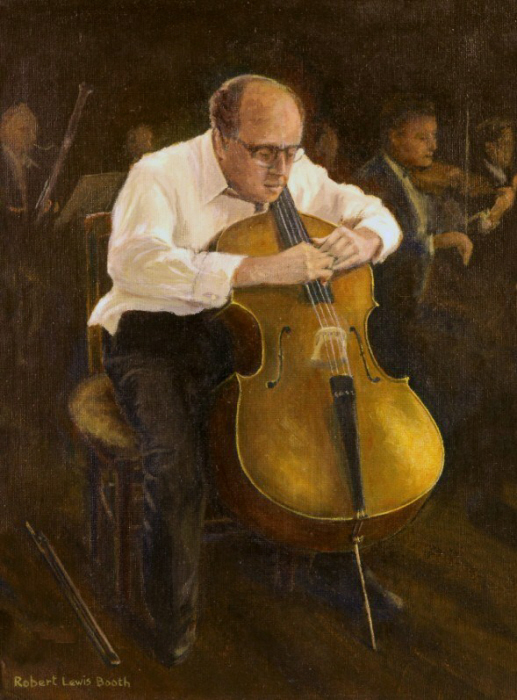 Rostropovich, Mstislav (1927-2007), Soviet-born musician, the most esteemed cellist of his generation. Born in Baku, Azerbaijan Soviet Socialist Republic (now Azerbaijan), he studied and later taught at the Moscow Conservatory. From 1950 he pursued a career as a cellist and conductor, also performing as a pianist in recitals by his wife, the singer Galina Vishnevskaya. 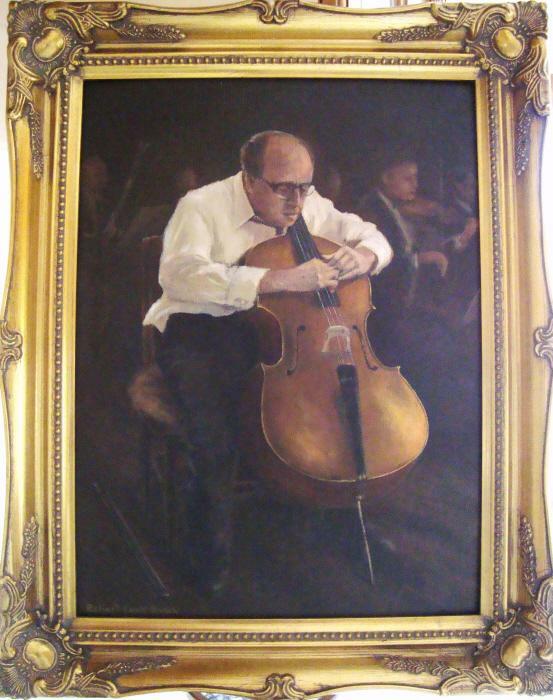 He commissioned or premiered many cello works by the leading composers of the day, including the Sinfonia Concertante (1952) by Prokofiev, both of the cello concertos (1959, 1966) of Shostakovich, and the Cello Symphony (1963), sonata for cello and piano (1961), and cello suites (1964, 1967, 1971) by Benjamin Britten. Despite winning the Lenin Prize, a Soviet state award, in 1963, he publicly defended the Soviet dissident writer Aleksandr Solzhenitsyn. in 1974 Rostropovich and his wife left the USSR, and in 1978 their citizenship was revoked. Having emigrated to the United States, Rostropovich became music director of the National Symphony Orchestra in Washington, D.C. in 1977, a post which he retained until 1994. He also made several guest appearances, and a number of recordings, conducting the London Symphony Orchestra. In November 1989 he famously played Bach cello suites at the Berlin Wall while demonstrators dismantled the barrier. He was invited to perform with the National Symphony Orchestra in the USSR the following year, and his and his wife's Soviet citizenships were subsequently restored. He continued to perform and conduct around the world until failing health brought an end to his solo career in 2006; he died in Moscow on April 27, 2007. Rostropovich, affectionately known as “Slava”, was one of the foremost musicians of the 20th century, highly regarded not just for his work as a cellist, conductor, and champion of Russian music, but also for his impassioned defence of artistic freedom. Outside the musical sphere, he and his wife set up the Vishnevskaya-Rostropovich Foundation in 1991 to improve health care for children in the former Soviet Union. His many awards and accolades included the Royal Philarmonic Society Gold Medal (1970), the Annual Award of the International League of Human Rights (1974), the Legion d’honneur (1987), Knight Commander of the British Empire (1987), the Polar Music Prize (1995), and the Russian Order of Service to the Fatherland (2007).